For the second year in a row, Second Life’s community is organizing Second Life’s anniversary celebration – and this time, the occasion is even more special, because we are talking about SL’s 10th anniversary. The celebration will be held in June, but the recruiting phase for those who would like to take part in the organization of the event starts on April 15. For the application forms and for further information and updates, you can check the SL10B Community Celebration website. The theme for the community celebration, this year, will be “Looking Forward, Looking Back”. Inspired by that, I decided to visit Da Boom, the very 1st region in Second Life, created in 2002 – even before SL was officially launched to the public, in July 2003. Da Boom, named after “De Boom” street in San Francisco, is full of stuff, but what called my attention the most in this visit was the small parcel there called “Mathematical Art – Escher’s Relativity and Seifert Surface”, for it gathers some of the most emblematic objects seen in SL’s history. I started my visit above ground level, floating in the sky, where I found the virtual version of M.C. 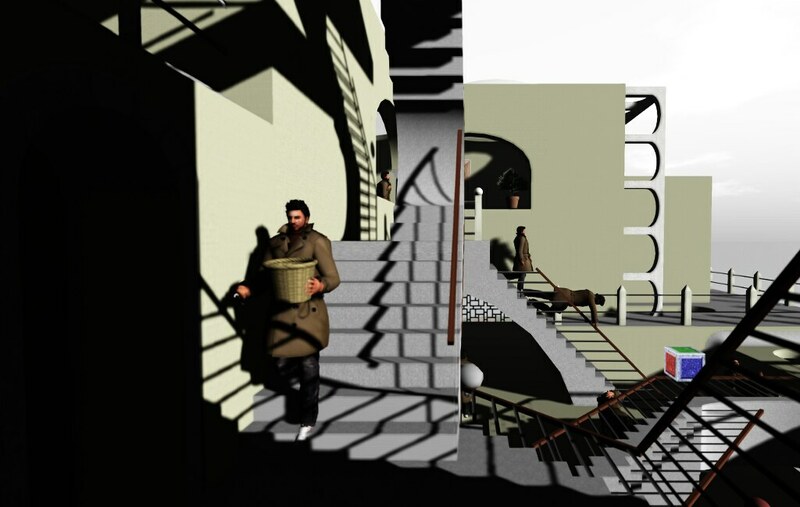 Escher’s Relativity, by Furia Freeloader. 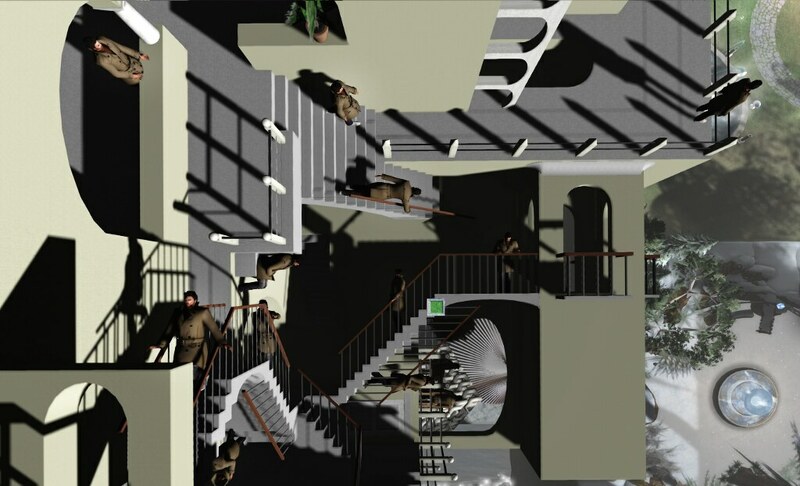 The building dates from 2007 and is inspired – of course – on Escher’s famous lithography on which we see a scene that defies gravity, with people climbing stairs which are disposed according to varied orientations. 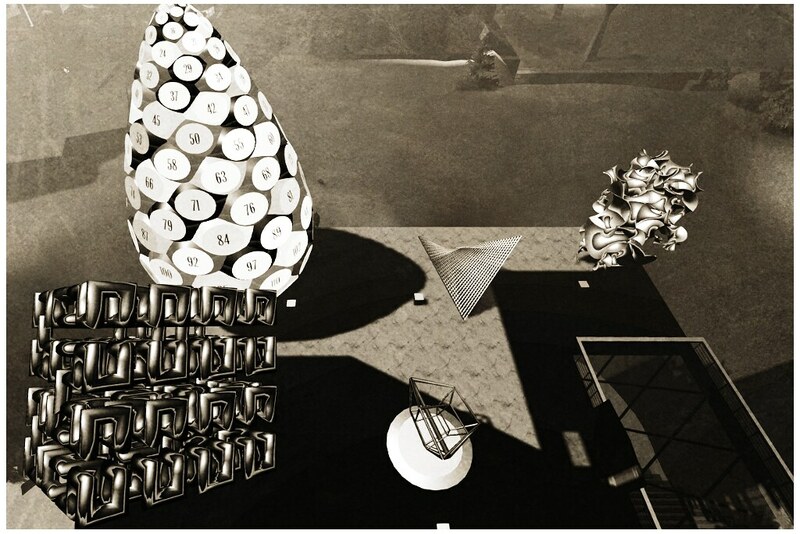 Furia Freeloader’s building is an example of what can take form in SL, where we can free ourselves from the constraints and limitations of the atomic world. The building, as M.C. Escher’s model, has three different gravity axes. 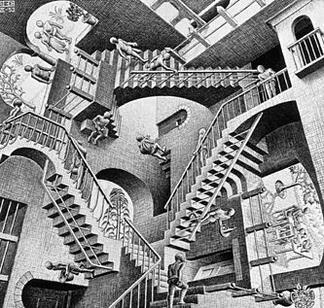 Each stairway can be, in theory, used in two different axes (I say “in theory”, because actually not all stairways have the correspondent pose balls for being used in two axes, what comes from the fact that Escher’s original lithography, itself, also doesn’t display people climbing all the stairs in two axes). Below Furia Freeloader’s building, there’s a collection of objects by Seifert Surface (or Henry Segerman) – the creator of the Crooked House about which I posted here. Surface’s own SL name seems to be, already, a declaration of what his work is about. 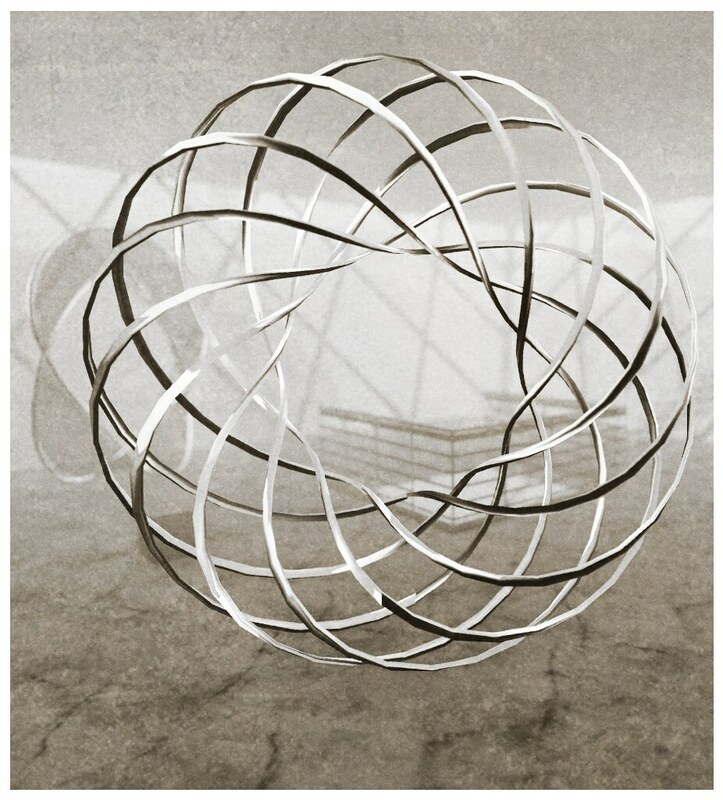 In mathematics, Seifert surfaces are those which have boundaries that are mathematical knots or links. You don’t have to really understand what that means, though, to realize that Surface’s builds in SL are objects that derive from mathematical equations and proprieties. 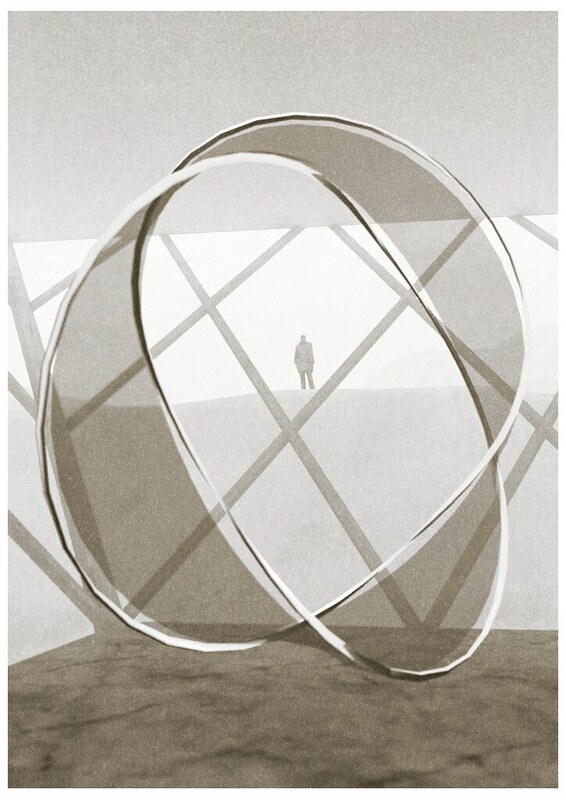 As Seifert Surface’s profile in SL says, he’s “left Second Life as an artistic medium in favour of 3D printing”. Nonetheless, at Da Boom you can see, two of his torus knots, dating back from 2005; his Fibonacci Pinecone (on which spirals follow the Fibonacci sequence – 0, 1, 1, 2, 3, 5, 8, 13 – where the first two numbers are 0 and 1 and the following numbers are the sum of the two numbers that precede them), which dates from 2007; his “z = xy”, which is a surface defined by that mathematical equation and was built in SL in 2005; the Negative Curvature Fractal 4, also from 2005; the Hilbert Cube, from 2007; and the Meandering Hypercube, from 2006, which can be considered a projection of a 4D hypercube on a 3D space (you can read further on that kind of projection on my post on the Crooked House); among other objects. All that, remember, was built before the current mesh-era. Isn’t it amazing?